All things considered, 2018 was a good year for the Germany-headquartered Heller Group: in the fiscal year, the company generated a sales volume of €558.3 million, slightly below the previous year’s level; however, with a volume of nearly €700 million, order intake reached a new high. Heller booked orders worth €695.2 million, corresponding to a rise of €82.3 million or 13.4%. With a total of €546 million, the current order volume has also reached a high. The number of employees increased moderately from 2,440 in 2017 to 2,590 in 2018, while equity ratio increased to just under 35%. Heller generated €142 million in service sales, exceeding the planned target, while machine business contributed €412 million to revenues. In 2018, Germany remained the most important market for the group, with a sales volume of €192 million (34.4%). Throughout the rest of Europe, the company recorded a slight decline in sales revenues. Particularly pleasing was development on the Asian continent. At the end of the year, this reflected in a rise of approximately 27% (€148 million). Business in South America also developed well with a 46% sales increase. Despite a continuing slowdown in automotive project business throughout the course of the year, order intake in this sector still accounted for more than 50% of new-machine business at Heller due to a major project. Investments in electromobility gained in significance, while business with cylinder bore coating, contributing to a significant reduction in CO2 emissions from modern combustion engines, was also successful. The strongest growth was achieved in applications outside of the company’s traditional automotive business, especially with 5-axis machining. Heller also reports a strong increase in production automation investment, and demand for digital services. In terms of project business, order intake was more or less in line with forecasts, still accounting for more than 50% of new machine business. Looking at the development of order intake according to region, Europe was the strongest sales region for Heller machines and services. More than two thirds of new orders in 2018 came from the European market. Of particular note was development of the domestic market in Germany, contributing the lion’s share with just under 30%. Some 17% of orders came from Asia, with 12% from the Americas. In the past fiscal year, Heller Group invested a total of €18.5 million in measures to increase capacity and promote modernisation. One priority was the digitisation of internal processes. Also of note, an additional assembly hall is currently under construction in Nürtingen, which will house the final assembly of 5-axis machining centres, while completion of the new ‘spindle line’ at Heller’s manufacturing facilities finishes the investments at the company’s headquarters in Swabia. At the Brazilian production plant in Sorocaba and in Troy, USA, Heller invested in the modernisation of machinery and office equipment. Moreover, the company group was expanded in 2018 with the acquisition of Paatz Viernau GmbH, based in Thuringia. In terms of outlook, political uncertainties, disputes about mutual trade barriers – especially between the US and China, the high debt burden of many countries, and the seemingly endless debate about Brexit are becoming increasingly visible. The politically driven discussions about future drive concepts are an additional source of uncertainty, and impact upon investment decisions. The uncertainties give further reason for the globally apparent decline in short-term awarded automotive projects, although discussions in Germany are more intense than elsewhere. After all, competition and price pressure within the industry remain high, while the procurement market and material supply continue to be bottleneck factors. Forecasts for the global economic situation in 2019 remain cautiously optimistic for international markets, as well as for Germany. 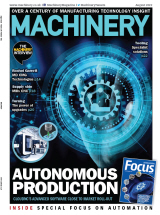 Global consumption of machine tools will remain at a high level throughout 2019. Heller also expects this development to be reflected in the submarkets in which the company is present. The start of the first quarter was slightly below expectations, which was mainly due to a slowdown in automotive project business. “Due to full order books we expect good capacity utilisation, growing sales revenues and a good annual result for 2019,” predicts Winkler. Moreover, 2019 is a special year for Heller in which the company celebrates its 125th anniversary. In 1894, Hermann Heller, only 25 years old at the time, founded the company ‘Hermann Heller Handelsgeschäft und Produktion von geschützten Artikeln und Uhrmacherwerkzeug’ in Nürtingen – specialising in the manufacture of watchmakers’ tools.